Adrienne Bailon Houghton shared some pretty unusual recipes while filming a YouTube food video for fans. 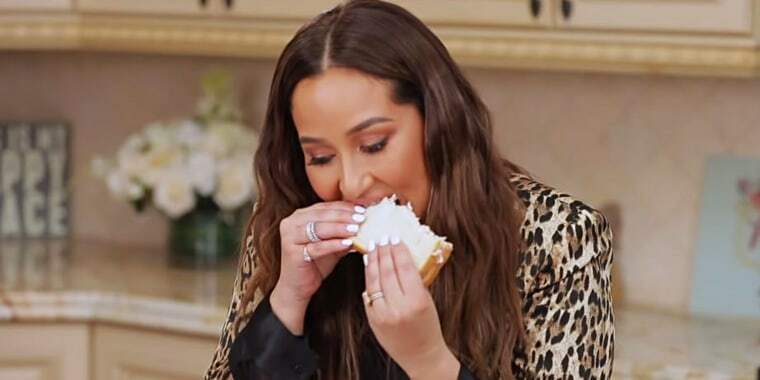 Adrienne Bailon Houghton might have just outdone mayonnaise ice cream by sharing one of her favorite recipes with the world. In fact, mayo might be the most palatable part of the dish Houghton made during a segment called "Favorite Weird Food Combinations" on her YouTube channel. The former star of Disney's "The Cheetah Girls," 3LW band member and ex-girlfriend of Rob Kardashian included an overview of some of her most unique creations on "All Things Adrienne." In the video, she makes tuna salad, quesadillas, fried Cheerios, and then demonstrates how she eats some of these items. The video has garnered more than 1.2 million views and is already causing a social media frenzy. Houghton prefaces the episode by writing in the caption, "Y'all ain't ready for my favorite weird food combinations ... I made up half of these as a kid growing up in the lower east side projects [in New York City], but I'm still eating them today in my Bel Air home — that's how you know they're really good!" The singer's tuna salad recipe starts out with a pretty standard base: She mixes together canned tuna, mayonnaise, salt and pepper. But then, she adds the unexpected: a splash of fruit punch! She mixes it all together until the mayo-based salad takes on a rosy hue. After constructing the sandwich on white bread, she takes a bite, and then goes for an extra blast of fruit flavor by dipping the sandwich into a glass of fruit punch. "I just had really high-end taste buds with a really low-class budget," she says in the video. Houghton even invites one of her producers into the kitchen to try the fruity-fish sandwich and ... she's not totally disgusted by it and she even admits that it's pretty good. That second opinion, however, wasn't enough to keep away a frazzled flood of YouTube comments from fans. Many also took their shocked, disgusted and surprised reactions to Twitter. Some people are just pretty upset. "When I saw some of the tuna falling into the Fruit punch I gagged," one person commented on YouTube. Though Kool-Aid pickles are beloved for their sweet-and-salty tanginess, it turns out that a lot of people just can't get behind the idea of Kool-Aid-flavored tuna. "Tuna fish and fruit punch sandwich.... I’m upset, I’m confused, I’m intrigued, I’m worried, I’m annoyed at myself for being open to trying this," another said. Next on the menu, Houghton makes a cheese quesadilla. But instead of adding veggies or meat to the melted cheese inside, she adds ... bananas. This was less terrifying to followers than the fruit punch (after all, cheddar cheese and apple pie is a pretty lovely combo). But still, people are freaked out and want the video to be erased from their memory. Following the quesadilla, Houghton dips french fries into ice cream, which certainly isn't the craziest french fry-dipping method to storm the internet recently. But then she proceeds to mix white rice and peanut butter, commenting that it's basically like Thai food without the spice. Fair. She ends the cooking portion of the video by frying Cheerios in butter, which actually garnered positive feedback. "Ok the fried cheerios looked good actually," one person commented on YouTube. Agreed. Perhaps all that's missing from the mix are some melted marshmallows and Houghton's got herself a Cheerio-style Rice Krispies Treat.